BOAT SHOW SPECIAL -- $40,000 PRICE DROP -- NOW $249,000 The Meridian 391 Sedan was introduced in 2006 with stylish sweeping lines that distinguish her from other boats in her class. The below deck accommodations are more spacious than other boats of similar size. The Meridian 391 has two staterooms both with queen size berths. It has a split head, vanity with sink and vaccu-flush head in one and aseparateshower in the other. The very large salon has a L-shaped convertible sofa, two chairs, wine chiller, circular dinette that also will convert to a sleeping berth if needed, and a full galley. There is room to entertain several guests on the huge bridge with forward center-line controls. The interior has been updated with teak and holly flooring. The boat has bow and stern thrusters, satellite TV, newisinglass, and a complete electronics package including radar, Forward looking sonar, and an autopilot. The engines only have 296 hours.The owners have spared no expense in maintaining this boat. Last bottom job October 2017. Boat is washed every two weeks and a diver cleans and inspects the bottom every month. The boat is a must see. 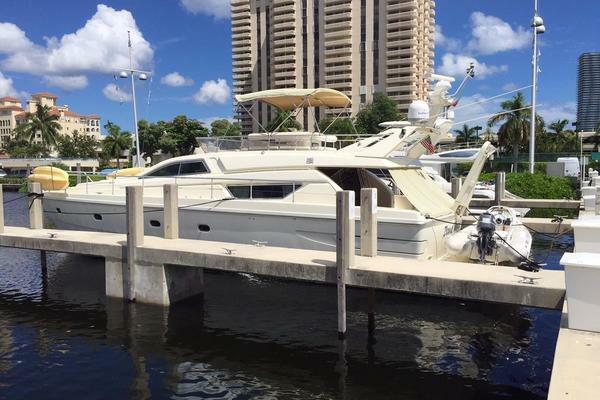 United Yacht Sales New Jersey would love to guide you through a personal showing of this 39' Meridian 391 Sedan 2010. This yacht for sale is located in Orange Beach, Alabama and priced at $249,000. For a showing please contact us by filling out the form on this page and we will get back to you shortly! Knowing that some family cruisers look like minivans, Meridian designed its 391 Sedan to bring the styling and performance of a sportscar to the class without losing any practical features. This attractive yacht's sleek profile conceals a wide-open salon with warm cherry-wood interior, custom teak & holly flooring throughout, homelike seating arrangements and 360-degree views of the horizon. She also features a dedicated dinette and fully-equipped galley that are seamlessly integrated into the main living space, two large staterooms and separate shower and head compartments, each with its own vanity and sink. The flybridge's distinctive overhang offers more space topside as well as cockpit weather protection, and its molded-in steps are hinged to provide direct engine-room access. Why settle for a floating box on the water when you can enjoy all the style, performance and comfort of the 391.